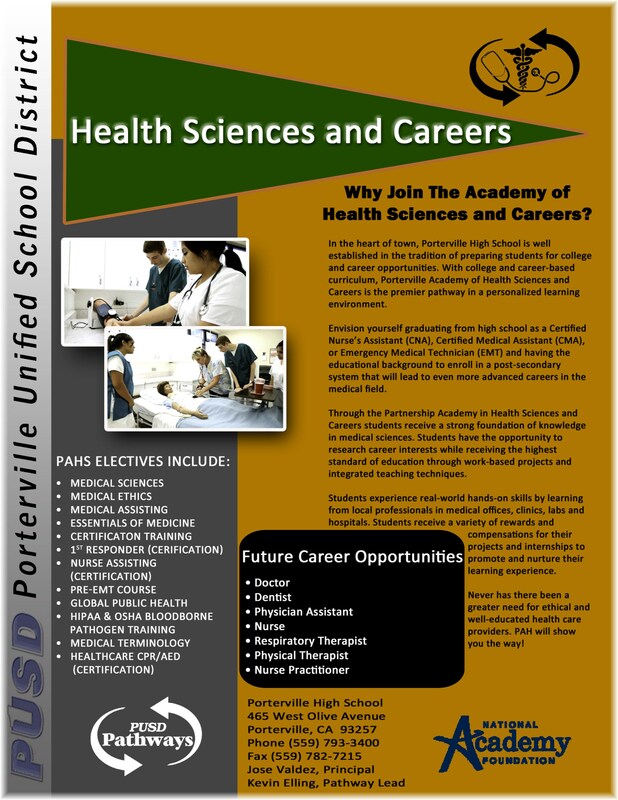 Porterville High School’s Partnership Academy of Health Sciences (PAHS) is an open-choice academy that has reached the highest standard of ranking with the National Academy Foundation (NAF): Distinguished. PAHS is a 9th-12th grade pathway for students considering a career in the health field. This would include medicine (nursing, medical doctor, etc.) preventative medicine (chiropractic, osteopathy, nutrition, etc.) and allied health care fields (dentistry, optometry, podiatry). Students take a variety of health-related classes throughout their high school career which are specifically designed to be engaging and relevant. The program is rigorous and is not for those who want an easy life. Students have the opportunity to earn several certifications while in school such as First Aid, CPR, and CAN. Students can leave school ready to work or go on to a 2-year, 4-year, or graduate degree program.